An excellent gent's jumper by M&S. Navy blue colour. Cream Aran Chunky. Size Large. There is no BUY IT NOW option for this item. Excellent condition. See photos. Authentic Debenhams Jasper Conran. Made from lambswool rich fabric. S: (armpit to armpit: 21" - length: 28"). M: (armpit to armpit: 22" - length: 29.5"). L: (armpit to armpit: 24" - length: 30"). XL: (armpit to armpit: 25" - length: 31"). WHITE STUFF LAMBSWOOL JUMPER. Great quality lambswool rich fabric. M: armpit to armpit 21"/ length 28". 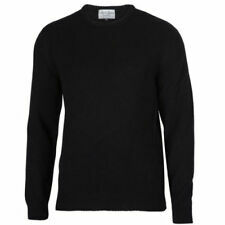 This is a luxurious extra fine fibres, sumptuously soft and cosy pure lambswool jumper. It’s machine washable and tumble dryer friendly for added convenience. It would be perfect for both formal and casual occasions. CELTIC & CO FINE SLOUCH ROLL NECK JUMPER (DARK NAVY SIZE MEDIUM B GRADE). RRP. £110 Condition is New with defects. Defect may be a frayed edge or a miss alignment of the sleeve pattern. Label has been cut to avoid store returns. Free Postage. Men Armani Button Front Cardigan Black Wool XL. Condition is Used. Dispatched with Royal Mail 2nd Class. This is a jumper from Hartford. It is a purple knitted jumper. States XL but suits slim large more. 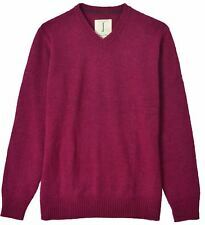 Ede and Ravenscroft Mens Jumper. Condition is Used. Dispatched with Royal Mail 2nd Class. 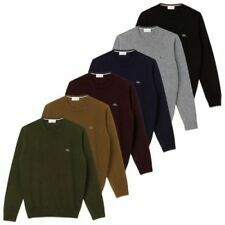 Mens Barbour 100% shetland wool jumper large. Immaculate condition, worn once. From a clean, pet and smoke free home. Very warm sweater, rib cuff and hem. Khaki green marl wool. Beautiful item of clothing. Would suit outdoor enthusiast. Cost over £120 new. Fabulous grey knitted polo shirt from Reiss. A fantastic quality, grey wool, polo style jumper by Reiss. This fine knit jumper, is light grey and made from pure wool. 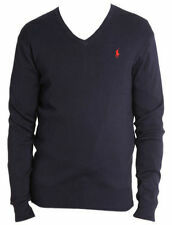 It is a polo style jumper with a collar and 3 buttons at the front neckline and long sleeves. Size XL 22.5” Across Chest, 27” Length Made in England 100% New Zealand Merino Wool Fine knit Midweight yarn Beautiful quality Mother of pearl buttons Grape in colour Worn but very good condition. Men's Barbour 100% Lambswool Crew Neck Jumper Russet Colour Size UK M.
Chest : 46". Hand Wash Only. Waist : 44". Length : 27". AIGLE 100% Lambswool Jumper Dark Beige Crew Neck Size XL Chest 42/44"
AIGLE 100% Lambswool Jumper Dark Beige Crew Neck Size XL Chest 42/44". Condition is Used. Dispatched with Royal Mail 2nd Class. Vintage Glenhusky Of Scotland 100% Wool Suede Leather Men’s Cardigan Brown Large. Condition is Used. Dispatched with Royal Mail 2nd Class. Long Sleeve Jumper Sweatshirt Top. This top is a fab jumper in good condition. Worn and washed with no noted defects. JEFF BANKS. Plain with no patterns or logos. And a few bits for the kids too. Men's Grey Lambswool Scotch and Soda Jumper Medium . Condition is Used. Dispatched with Royal Mail 2nd Class. Lyle & Scott Vintage Range Cream V Neck Jumper- Large Eagle Logo- Size L. Fine knit. Excellent Condition. Dispatched with Royal Mail 2nd Class. I purchased this on eBay for £7 but it’s too small for me. More like a M.
Really nice V neck jumper. Feels a touch small/maybe slim fitting. Very good used condition. Ted Baker London Mens Jumper Red Merino Wool Crew Sweater Size 5 UK XL. Condition is Used. Dispatched with Royal Mail 2nd Class. Made from pure lambswool. Size: Large (to fit 42" chest). Yellow in colour, v-neck, regular fit. Small: Armpit to Armpit: 23.5" -Length: 29". 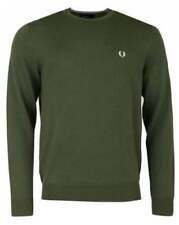 Mens Green Pure Lambswool Jumper by PRINGLE - Chest 40"
Pringle Superwash Lambswool Jumper. Chest = 40" Length = 26" - Label does state XS - but check the actual size. Gents Charcoal Grey Wool Pringle. Nice warm jumper from Lewins. On trend colour, 100% Wool, good quality garment. Has been worn and has a little bobbling (easily removed) and the zip works fine but the little ‘dangly bit’ from the zip pull is missing... (see pic). This doesn’t effect use, but to manage expectation. Size is S - Chest 38” and length from shoulder to hem 26”. Good with jeans and perfect for cool spring evenings. 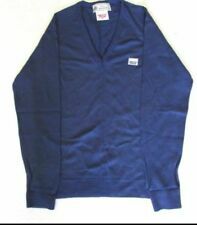 Mens JACK WILLS Jumper. (Size Medium). Made from pure lambswool. Yellow in colour, v-neck, regular fit. Small: Armpit to Armpit: 21.5" -Length: 29". Large: Armpit to Armpit: 23.5" -Length: 30".